Jennifer serves as the editor of the North American Saxophone Alliance’s scholarly publication, The Saxophone Symposium. She has presented research and clinics at conferences across the USA and Canada, and has published articles in several music education research journals. Jennifer holds a bachelors degree in music education from the University of Western Ontario, and masters degrees in saxophone performance and music education from Central Michigan University. Currently, Jennifer is a doctoral candidate in Music Education with a minor in Saxophone Performance at Indiana University. Sean Bradley Alto Saxophone Sean Bradley is a saxophonist from Mt. Pleasant, Michigan and is currently pursuing Masters degrees . 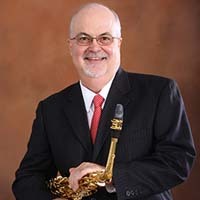 . .
John Nichol Piano John Nichol is Professor of Saxophone at Central Michigan University and has performed at the Montr . . .